There's no tighter competition than the elbow to elbow MX2 class, at amateur or professional level. 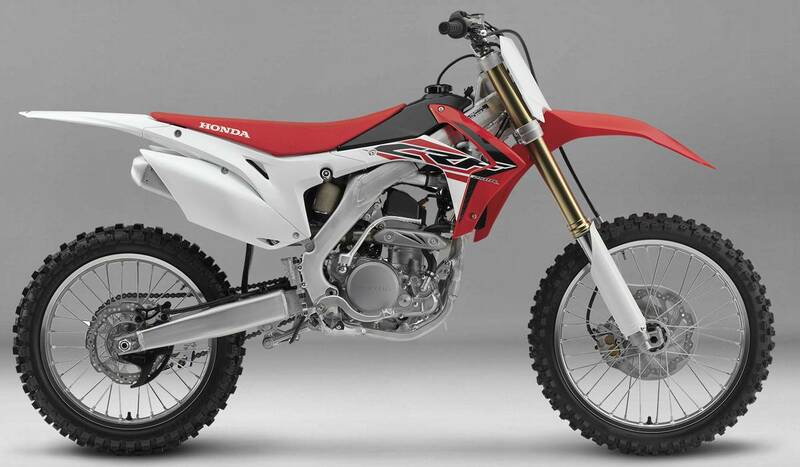 Honda's CRF250R has long been a potent weapon to take into battle thanks to its fluid power delivery and honed chassis that balances lightning fast agility with stability. The CRF250R's new 249cc four-valve unicam engine is smoother and stronger off the bottom, maintains its midrange Punch and as revs rise makes not only more power and torque, holds onto it at higher rpm and for noticeably longer - useful for stringing sections or corners together without changing gear. The increase in peak power and torque is due to extensive HRC development of the cylinder head. Both the intake and exhaust ports are redesigned to HRC specification and the 25mm diameter exhaust valves are now titanium (rather than steel) matching the 30.5mm intake valves. A brand new camshaft profile operates redesigned valve lifters; both intake and exhaust valve lift has been increased. The inlet valve spring material is also new. Honda's EMSB makes an already very usable engine even more adaptable. The rider just has to stop with the engine at idle and press and hold the button for just under a second to select the next map in sequence. A highly visible LED built into the lightweight button signals the map in use with a quick press and number of subsequent flashes. If a new map is selected the choice is also confirmed to the rider. The CRF250R's 49mm inverted Show® SFF-Air TAC fork weighs less than a conventional-spring design, it's easier to adjust, and it helps keep the front end planted. The 2016 model is also five millimetres longer to enhance the bike's stability.